High fashion world is always about breaking rules.There are a lot of style stereotypes which are dominated by a longstanding rule, and the fashion Jury giving guidance on what to wear it with what. But whats life without some sugar and spice ? Gone are the days when a Sartorial would suggest that we wear those feminine , and ultra flirtatious lace dresses with a hint of ladylike pumps, and how a scene from a 90s flick would make a women run for her contacts coz Betty like glasses and a date dress were a big NO then .Its new age and we contrive a stylish switch in the protocol. Today's women don't shy in adding a lil grunge to a lace dress and get a street style approved look. Pumps are swapped by Combat boots,those geeky glasses are stay put on the nose,and when it comes to jewelry , more is more like LITERALLY ! Mixing on some high and low turns out to be a more playful way to go about any day ! 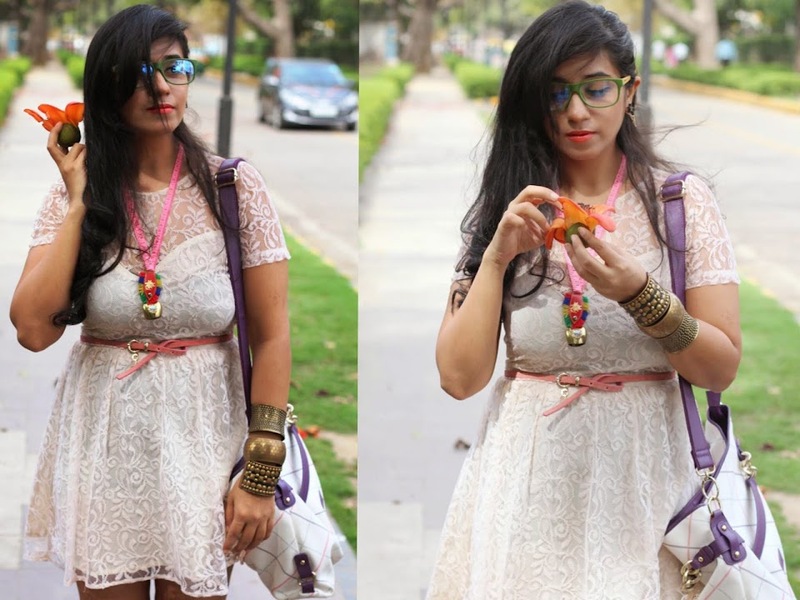 Ear cuffs, stacking on some junk bracelets and some wild DIY turned out necklace paired with that pretty lace dress flowing on a windy day, howz that for a wild side of change ? 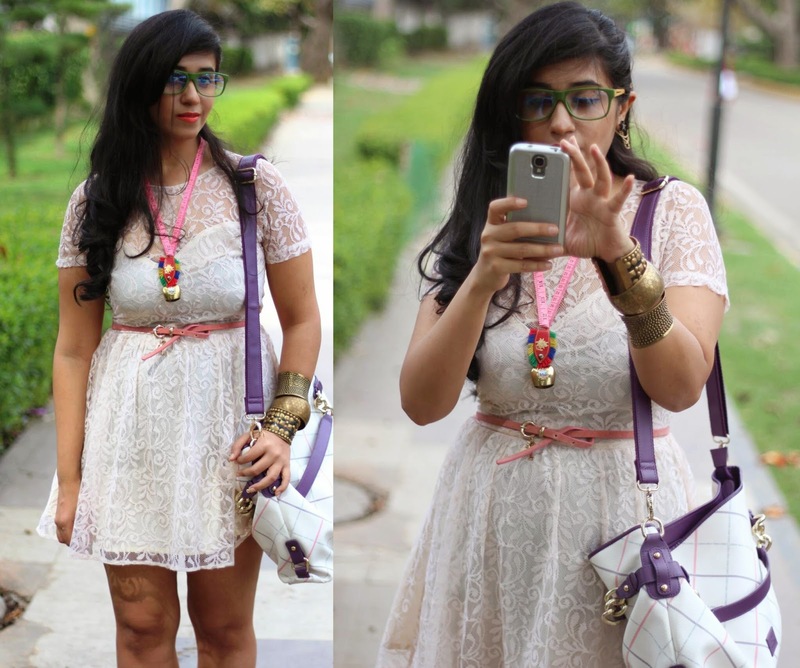 I wore this outfit on the last day of WIFW which happened lately. After hours of hunting, I couldn't get a perfect lady like dainty necklace to go with the look. It was then I decided to do a whole switch and not to stifle my creativity and let it go through some ebbs and flows in my own way. I converted this old key chain souvenir into a necklace, and the measuring tape was cut, Inspired by this bag of mine and the rest is all history ! 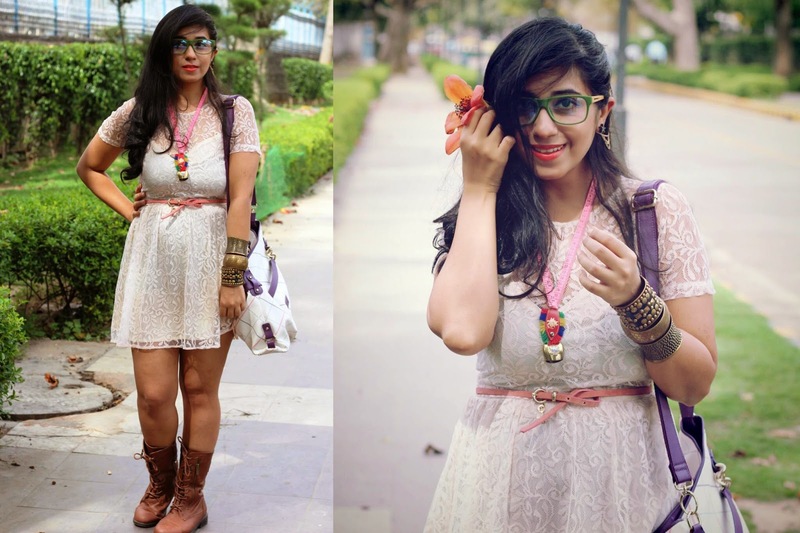 love the way you styled that laced dress and wear ear cuffs! Nice dress! Thanks for your comment, sure we can follow each other! Following you on GFC and Bloglovin', waiting for you! Love your dress, so feminine! I love to see what the girls are wearing in other countries. Fashion is global, no? I'm an Italian blogger. Do you want to come take a look at my blog? Thank you so much for the lovely comments and I can't wait to see the next post!! Wow!! !Love the whole outfit! The dress, those boots, the belt and that necklace is so cute!!! omg..that necklace is genius..! n u look fab..i absolutely adore ur glasses. You look so so cute! Love the glasses on you and the necklace is just genius! molto carina. un bacio ti seguo. you look great dear :) I love the dress! Love the look, and the glass is very cool. lovely look, love the boots and the green frame :) great accessories. So pretty, what a nice dress! I love dresses with boots! So casual yet , feminine ! Love the dress! love this all so much! 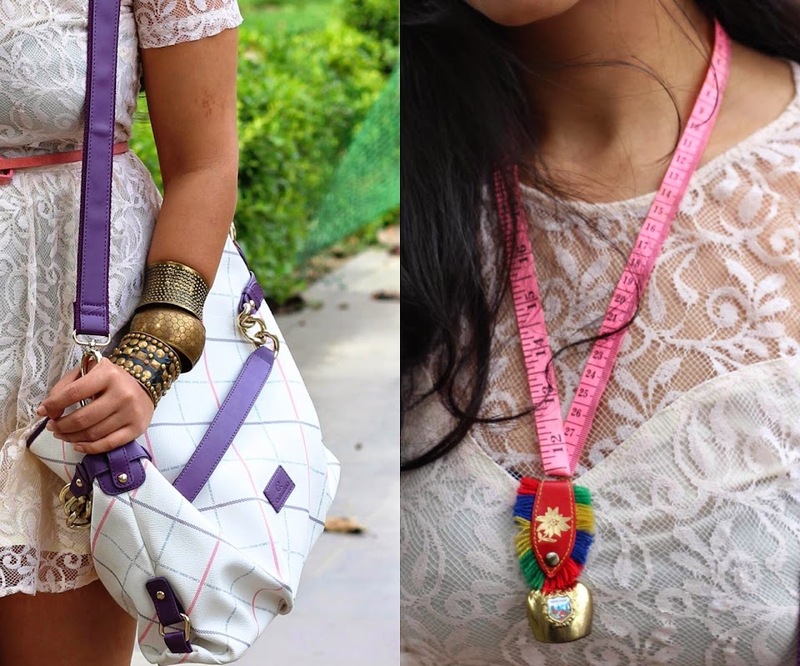 The way you accessorize is amazing ! The dress looks really nice on you! And the belt is super cute!